Stanford University's newest "musical" ensemble is called MoPhO, short for Mobile Phone Orchestra. 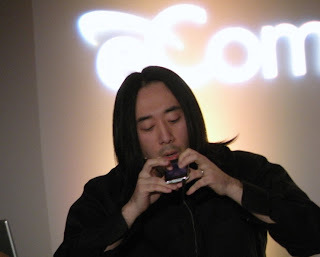 Its, "conductor", Ge Wang,(pictured above, passionately kissing his iphone(jeff....i told you this would happen dident i?) is a veteran of Princeton's "Laptop Orchestra" . and is obsessed with making electronic music as mobile as possible. "The iPhone holds a lot of potential for what kind of music can be made and how it can be made," Wang says.